The law in Portugal, as in most countries, requires that first a civil registration of your marriage takes place. The civil part can be done in your home country or in Portugal (though that involves more paperwork). 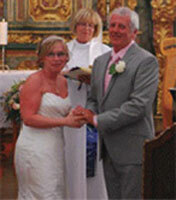 Following that a wedding or blessing service may be in a Church or private home, beach location or hotel. Please ask a wedding planner for guidance of possible locations for your service. We recommend this Wedding Planner to assist you with all the arrangements for your guests. She can offer a wide range of idyllic locations, from a beach to a historic Convent Chapel, all your accommodation needs, the wedding reception, transport and any other catering requirements. Please email us at info@allsaintsalgarve.org for more information regarding a wedding or blessing ceremony. Please note that we cannot assist with the civil part of your wedding, and that we will need to see evidence that this has already taken place. Many couples choose to do this part of their wedding discreetly and without guests, and then hold a traditional wedding service and reception. We have clergy in Lagoa and Almancil. In Lagoa we can offer the use of a 300 year old Convent Chapel, see 'Where we Worship' and then Lagoa in the menu on the right.